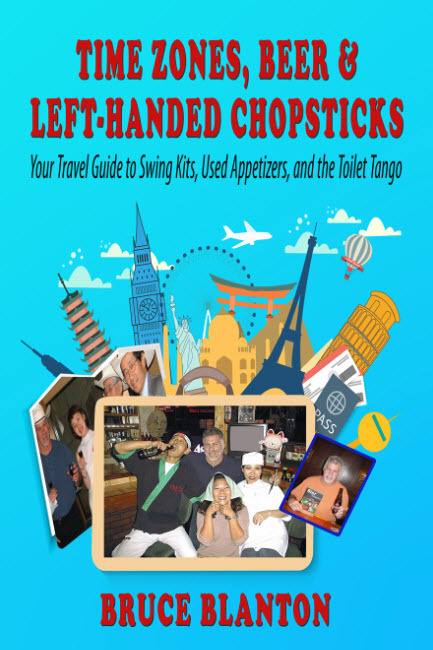 Time Zones, Beer, & Left-Handed Chopsticks is a quirky, humorous collection relating the author’s experiences traveling the world. Told with a keen eye for detail and a sly wit, Bruce Blanton captures many facets of travel, from frustrating to funny. As a man who has spent much of his career away from home, Bruce brings a voice of experience to his tales of life abroad. Readers will appreciate his quick wit and often self-deprecating sense of humor. Blanton is adept at showing that no matter how different people may seem, the same problems and fears plague us all. Most people associate travel with well-planned vacations to a tropical paradise. For the business traveler, travel usually means a last second trip that involves an uncomfortable seat on a long flight and sitting next to a person who has enough gas stored up in his body to fuel a small country. When your home address includes the words “International Airport” it usually means that you have given up many of the things that most people take for granted such as having a family, eating a home cooked meal, and getting up in the morning and not finding a rooster in your shower stall. Bruce Blanton has traveled the world (and he has also been to Texas) as a business traveler for more than 25 years. He has experienced the good, the bad, and the totally bizarre throughout his many trips. Bruce Blanton has put together his favorite memories in his book Time Zones, Beer, and Left Handed Chopsticks, which is a collection of humorous adventures, mishaps, and personal thoughts that have come from his years of travel around the globe. In his book, Bruce uses his humor to describe his experiences with used appetizers, toilets with speakers, a well-dressed duck, and so much more.